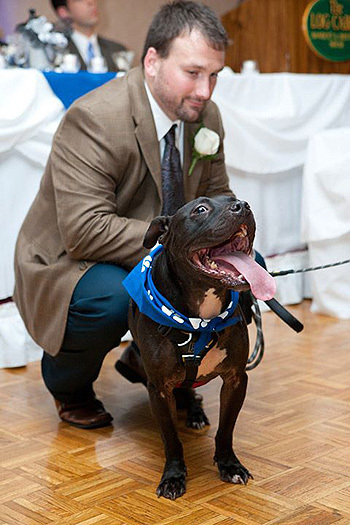 Q: Can you share with StubbyDog readers how first became aware of Cherry, one of Michael Vick’s former dogs, and what the adoption process was like since you live across the country from Best Friends Animal Society? A: I became aware of Cherry when he appeared on the “Saving the Michael Vick Dogs” episode of “Dogtown” on the National Geographic Channel in September of 2008. I watched that episode, and I just wanted to reach through the TV, grab him and let him know that everything was going to be OK. That night I couldn’t stop thinking about Cherry. I saw how he took to other dogs and how it built confidence in him. That’s when it became real to me. I already had a pit bull mix named Madison that I had had since I rescued her as a puppy when I was living in South Carolina. Charleston is a very dog-friendly area, and I was able to take Madison everywhere: to work, restaurants, banks, etc. This made her an ultra-socialized and confident dog, and I really believed that she would be the perfect match for Cherry. That night I put in an application for him. At the time, Melissa and I weren’t even engaged yet, and we were in the middle of buying a house. I told her about Cherry, and my exact words were “Don’t worry – we do not have a shot at ever being selected to adopt Cherry.” Melissa later watched the show, and she too thought that Madison would be great for Cherry. We followed his progress online, and after an update in February of 2009, I followed up on our application. Kristi, the adoption coordinator, e-mailed me back to say that Cherry just had knee surgery, and he wasn’t ready either mentally or physically to go into a home. She also said that it could be months or years before he was ready and that there was always the possibility that he never would be ready. She then said that if we wanted to start the lengthy Vicktory Dog adoption process that we could. We thought it was worth a shot. We then started to overcome the hurdles. First, we had to find new homeowner’s insurance, then we put in the court-ordered 6-foot high fence. After that we passed the criminal background check and the home inspection. Each step of the way we wondered if this meant we were going to be able to adopt Cherry. We started getting copied on the notes from his training sessions and vet checkups. We thought this was a good sign. Then one day in June, we got the e-mail! It was time for us to travel to Kanab, Utah, with Madison to meet Cherry. We were told that if all went well, Cherry would come home a week and a half later. We arrived in Kanab on Aug. 25, 2009 and spent three days with Cherry. The first day, all three of us, Melissa, Paul and Madison, sat on the floor as Cherry hid under a desk. After about an hour, Cherry decided it was time to cuddle and meet his new family. We spent a total of five hours on the floor that day. Somewhere in those five hours, we became a family, but we didn’t quite know it yet. The next couple of days we watched Madison become the most selfless and motherly dog we have ever seen. Cherry was so afraid of us, but he took right to Madison. We knew she was the perfect dog for Cherry, but we grossly underestimated just how perfect she was. We also took Cherry on sleepovers that were filmed for National Geographic and completed the necessary paperwork to foster Cherry before adopting. We had to leave Kanab at 6:00 a.m. to catch a flight, so Cherry couldn’t stay with us the final night we were there. That night, seriously, Melissa and I kept saying to each other that something was missing. It was Cherry! In a few short days Cherry had wiggled his way into our family forever. On Sept.10, 2009, Cherry came home! The process had taken a long time and was a bit detailed, but Best Friends made it so easy on us. We are so appreciative for all the things they did for us and for Cherry. It was a magical ride that keeps getting better! Q: Were there any challenges for Cherry, in terms of adjusting to a normal life with a family? Then, about two or three weeks after he came to us, he showed us he was going to be OK. We were in the backyard with the dogs. Cherry was over by the fence when he stopped and was just staring into space. Suddenly he stomped his paw and started hopping sideways and flinging his head. He hopped four or five times, stopped and then repeated the hopping in the opposite direction. We called it the “Cherry Dance,” and from that point forward, we knew he was where he was supposed to be. He quickly started to make big progress, and Madison was there for him every step of the way. She really took to him like a mother to a son. She is so selfless and protective of Cherry and without her, Cherry would have been lost. She was our link to him. She bonded with him so quickly, and he saw our bond to her. It was really special to watch. Cherry had never been in a home with simple things like the dishwasher, microwave or even a door closing. It was all new to him and scary. We decided to put Cherry on a schedule. We tried to feed, walk and go to bed, etc., at the same time every day so that Cherry would know what to expect. Dogs like him hate surprises, so we thought this was a good way to eliminate them. As Cherry grew more confident, we expanded his schedule and changed some things. I think the hardest thing for him to do was to eat and drink. When you think about it, when dogs eat and drink, their heads are down in a bowl and they can’t see what is going on around them. They are very vulnerable. So we started feeding Cherry on the couch. 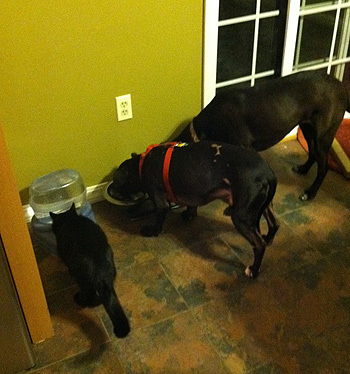 We then slowly moved his bowl towards where Madison ate. We put his bowl on a dog bed by the couch, and he would eat half on and half off the couch. Then we slowly moved the bed closer to where Madison ate. Once he was over to where Madison ate, we moved his bowl off the bed, and then slowly moved the bed further from the bowls until Cherry didn’t need the bed anymore and was eating right beside Madison. This took us six to eight months to accomplish but built a ton of confidence in Cherry as well as teaching him that our house was safe. It also strengthened our bond with him. One thing that was really sad to see was that for the first few months we had Cherry he slept with his eyes open. It was truly sad. There were many nights when we slept in Cherry’s bed with him. He needed to feel safe. It was a slow process getting him used to a home life. Everything had changed for him. We needed to be comfortable with Cherry being uncomfortable. We needed to know how to create the right level of stress that would produce a positive outcome. Too little stress and Cherry would not be pushed to do new things and take steps forward. Too much stress, and he might shut down or could regress. It was a fine line, but we really got to know Cherry and his signals. Now, at last we can say he is a normal dog at home. It’s great to see. 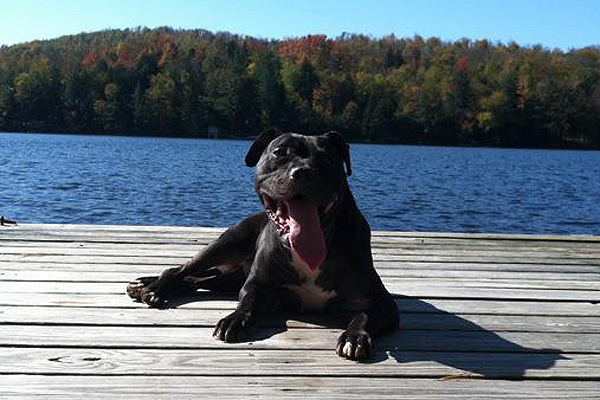 Q: How does Cherry change people’s perceptions about pit bulls? A: Cherry has a heart of gold. Everyone that meets him falls in love with him. Cherry and all of the Vicktory dogs are very unique in the fact that they have a voice. 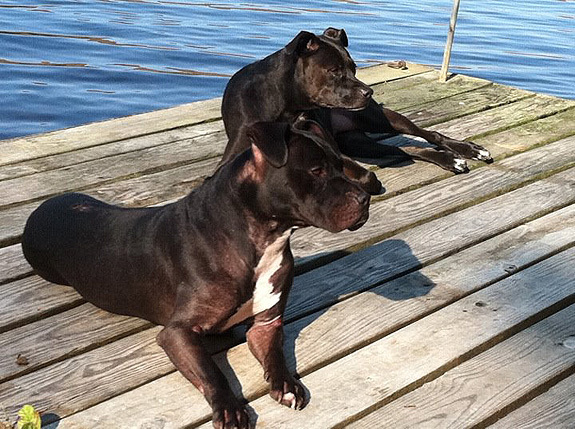 Since they are tied to Michael Vick, the media loves to report on these dogs. This comes with a lot of responsibility. We were not going to participate in public events because we thought it would just be too much for Cherry. We decided to do an event in Philadelphia in April of 2010. It was a small event and it was going to be attended by mostly children, and Cherry loves kids. We knew events would be stressful for Cherry, but what we learned was how important the events were to pit bulls and to building Cherry’s confidence. Cherry may have been stressed at the event, but it sky rocketed his confidence when he returned home to his routine. He started doing new things, and the things he was doing became second nature to him. We couldn’t believe it. So we started doing more events, and he gained even more confidence. So events really have a dual purpose for us: first, to educate the public, but second, to help with Cherry’s rehabilitation. One key thing we do at all events is to bring a huge treat bucket with us. We ask everyone that comes to meet Cherry to give him a treat. This teaches Cherry that people are good. He is so afraid of people, but by getting treats every time he meets a stranger, he establishes a positive interaction. At his first few events, he wouldn’t take treats from people, then he started taking treats randomly, and finally he was taking treats all the times. Now he will even approach strangers and sniff their hands to see if they have a treat. Not only that, but he obeys basic commands, like sit and paw, for strangers. That is pretty amazing when you think about it. This was a dog that would pancake to the ground at the sight of a human and now is confident enough to perform on command. It has done wonders for him, and we will continue to do events as long as we see positive progression. Events let us educate the public about Cherry, pit bulls, dog fighting and responsible dog ownership. They are very rewarding and lots of fun. We have had so many people tell us that his story has helped them understand dogs and changed their minds about pit bulls. It’s an awesome feeling to know that he is making such a positive impact on the community and can maybe help another dog or animal like him get a chance at life. 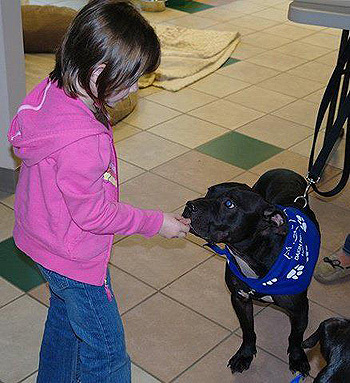 One of the things we hear people say is: “They are just dogs.” The Vicktory Dogs may be just dogs, but some of them have gone on to be certified therapy dogs teaching kids how to read, visiting sick people in the hospital or going to schools to educate kids. Some of them, like Cherry, participate in public events, making their communities safer for people and dogs. All of them are making a positive impact and helping their communities. If every human did just one thing that these dogs are doing for their community, this world would be a much better place. They improve their communities and the world. If that is what can be accomplished by “just a dog,” then we should all strive to be like a Vicktory Dog. Q: Can you explain the award Cherry recently received? How did the Massachusetts state legislator hear about Cherry?! It was a really special moment and very significant that the state of Massachusetts is working to abolish breed-discriminatory legislation. We hope that this opens the door for us to establish more relationships with local, regional and national government leaders. They need to be educated just as much, if not more, about pit bulls and dogs in general than the general population. They are the decision makers that are putting the public in financial stress, and they make our communities dangerous by enacting BDL. The speech was well received, and we got a ton of positive feedback. We really hope to do more public speaking in the future. Cherry and Madison were a hit, and Cherry once again was amazing. Q: What are your plans for the future? Any special projects in the works for Cherry? A: Well, we really hope to continue participating in public events and doing more public speaking. We would also like to start going into schools and educating children about pit bulls, dog fighting, and positive dog and animal ownership. We also have a very special and massive project in the works that Cherry and the Vicktory Dog fans are going to love. It’s too early to comment on that, but stay tuned! Most of all, our number one goal is to continue Cherry’s rehabilitation. He has come further than people said he could, and we know he hasn’t made it to the summit yet. He is a special little guy! What a great story. So happy everything has worked out for Cherry and your family. Thank you for this wonderful piece on Cherry. I too have followed his progress and he stole my heart long ago. Thank you for giving him a loving home and having the patience and respect to allow him a place where he could come into his own. You are indeed Sharing The pit Bull Love. @AdrienneClegg It’s so nice to see Cherry so happy in his home. Thanks Adrienne! Cherry is a remarkable fellow. His life could have turned out so differently. His family has made him whole and he may have moments of fear and anxiety but he is safe and surrounded by love. It’s wonderful to see this beautiful dog at peace and loving life. @Little Red We couldn’t agree more Little. And we are so happy you too are having a life that is safe and surrounded by love. We would love to share your story too, if you are interested, please email [email protected]. You are truly an inspiration to us like Cherry! Amazing!! What a fantastic job Cherry’s family is doing and major kudos to Cherry for taking a chance and trusting again. I’m so happy to see him doing so well and being the brave soul that we know he is. Keep enjoying life Little Man!!!! @RachelBrownRichards Their patience really paid off, Cherry is blossoming into the boy he was meant to be. The picture with Paul and Cherry smiling! just says it all. Such a proud papa. (And I know mom was there, too, so she’d be the very proud mama.) It’s a win-win for sure! Awesome story and what an awesome couple you are, Paul and Melissa. This took a lot of work and patience. Bless Madison for being such a good girl. I think we have the same sort of female in our Inca, so reading about Madison and her mothering of Cherry warmed my heart. 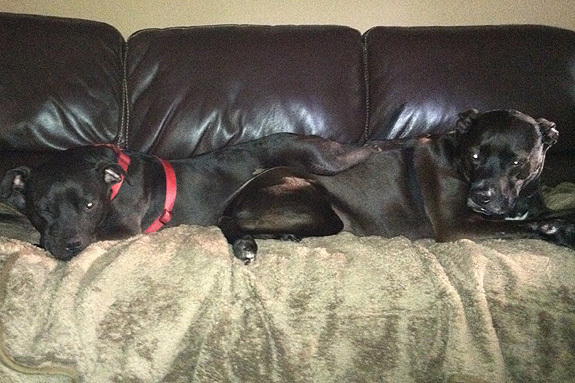 @pitbullsrock Isn’t it just amazing how dogs can help heal other dogs? Wonderful story. Thank you so much for giving him such a loving home! We run a non profit rescue and get a lot of different breeds, Pits included of course. I’m always surprised when people return a dog to us in a matter of days because they’re “not working out” – and then I read a story like this, where someone changed their entire life to accomodate the recovery of a dog. Made my day to know people like that are out there. And thank you for the wonderful story….it was heartwarming. @bakercon I agree. Every time we have adopted a dog and filled out the lengthy application, asking questions like what would make you return this dog. It makes me realize how many people do not take dog ownership seriously. I am so proud that this family, not only took the time, but also dedicated their life to their dogs. @bakercon It is heartwarming that Paul and Melissa really were devoted to helping Cherry, it’s unfortunate that many people don’t realize the adjustment time some dogs need, or that some dogs may never be all we want, but they still deserve a loving home, with people that will love them, no matter what. I had the pleasure of meeting Cherry and Madison at the Dakins animal shelter on Pit Bull awareness day this past october, and it was awesome!!! Cherry is my favorite Vicktory dog, and I have been following his progress since day one. I sat on the floor at Dakins and Cherry let me pat him, I was in heaven!!! Madison is so sweet too, and was very protective of Cherry. Its amazing what a little love and time will do. @JenFortin That’s so wonderful. And isn’t so great to get love from a dog when it isn’t given freely, and you have to earn their trust, it makes it that much sweeter. I love this story! Bless Best Friends and the Vicktory dogs and for those who do not condemn this wonderful breed. Thank you everyone for all the kind comments. We read all of them and its always nice to hear from other bully advocates!! Plus Cherry and Madison love to hear all the love out there! Also thank you to StubbyDog! It was so nice to speak with you and be apart of your wonderful organization! very touching and positive story. i have been following cherry and other “vick” dogs and my heart couldn’t be happier that these lovely creatures are now happy, healthy and out of harms way…”Vick’ Way!”. thank you for sharing they story and keeping all updated on Cherry. But i do just have to say this, Vick makes me Sick for what he has done to those defenseless animals.Thank god they are no where near him now. @diana russellThere are some things these dogs can teach us: resilience, forgiveness and the ability to live in the moment. What wonderful people to devote the time and love to make Cherry happy and safe. There are so many dogs out there that need homes,I wish there were more people like them ! 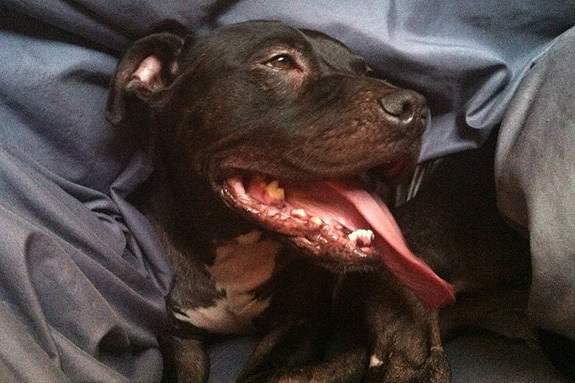 I think Vick should have been fined 50 % of his earning for life,to go to no kill shelters. kay, i couldnt agree with you more! !